Starting Your Kids Off With Saving And Investing | Extrapolate This! I remember when I was growing up – I had a passbook savings account. Some of you may not be old enough to remember those “passport” like books which you used as your savings account. I would collect $10 or $20 and go with my mom or dad to the bank so I could deposit my money and have my passbook updated showing my money grow. Of course then I didn’t have the appreciation for saving money, or money in general for that matter. But I can still remember how cool the feeling was to see my money in the passbook increase. That little nugget of a feeling still helps me today. I’m not sure the options that were available back then to get a kid started with saving or investing. The passbook and savings bonds were all I had. They taught me some valuable lessons about interest and saving for things you want down the road. But today, there are so many options available to help a child start off saving and/or investing. And in some cases you don’t even need to be a parent. There are some options you can start and help a niece or nephew, grandchild, anyone, off right. Here’s a few of the options we have today, some of which we used ourselves for my kids. Early on we started the kids off with the modern version of savings bonds, the I-Bond. The US government still wants to encourage saving and what better way than to help increase the national debt? I’m kidding (not really though, it does contribute), but anyway. You can invest in your country and earn interest. Treasury Direct makes it uber easy by doing everything online. By the way, you technically can purchase the EE/E savings bonds (the old paper versions you’d see in banks), but as of 2012 there is no physical bond, it’s all electronic. The I-Bond is a more attractive option these days. You can get a better interest rate elsewhere, but I’ll get into more detail further down in the post. Regardless, I-Bonds can be attractive at certain times. The I-Bond pays out interest based on a fixed % as well as an additional % for inflation. Currently, there is no additional inflation %. The fixed rate is 0.26%. And the fixed rate is subject to change every May and November. Some other caveats: you need to hold the bond for one year before you’re able to cash it. They want you to hold it as long as possible, but one year is the minimum. Also, if you cash it prior to owning it for 5 years, there is a a 3 month interest penalty so you’ll end up giving back the last three months worth of interest if you cash it in within 5 years of ownership. Still, it’s a pretty straightforward way of saving and there have been times (back in the good ol’ high interest rates days) where I was seeing 6-9% with the combined fixed and inflation rate. Crazy! 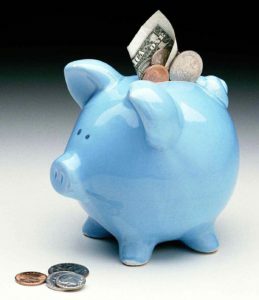 If you’re going to start saving money for a child, I think this the first thing you should do is open an online savings account. With how easy and safe online banking and transfers are today, online accounts are where it’s at. Plus, since many of the big names in online banks don’t have physical locations as an added expense so they typically offer you better deals overall, not just with savings. A couple of the big names out there include Capital One (0.75% / 1.0% >$10k), Ally (1.0% on all amounts), and Barclays (1.0% on all amounts) just to name a few. Most have no minimum amounts to open and can all be done online with a bank transfer. 529s are for college savings and can be a really good way to start teaching the youngster about investing as well as help you pay for them to go to college. Most of the large investment firms carry 529 accounts you can open including Fidelity, Vanguard, Edward Jones. I’d suggest checking with your current firm where you may have a 401k or an individual account already established so you can keep everything under one roof. 529 plans offer a pretty sweet and hard to beat tax benefit: contributions aren’t deductible, but earnings are as long as they’re used for college. Plans are offered by nearly every state and you don’t need to stick to your states plan if you don’t want to. 529s are easy to set up and relatives or friends can typically contribute directly to the plan themselves. Saving For College is a handy site since it showcases several options for the future college-bound kiddo. Almost all of the big firms have custodial accounts you can set up for a child. I remember when I opened one for my youngest. I suggested stock in a video game company he really likes. He got such a blast in knowing he owned a part of the company. Following the stock month after month was a fun activity to do together too. Again, your best bet is sticking to a firm you’re already using for a 401k or your own brokerage account. Check them out; setting up a custodial account can be done in minutes. I started with Sharebuilder (now Capital One Investing). It was fun to pull up the app on a whim to show how good (or bad) the stock was doing. One of the keys to getting and keeping your child interested in saving and investing is really showing them how it all works, how the money can grow (and sometimes lose) money. Have them suggest some stocks to buy and watch them over time together. With the low costs today of opening a custodial brokerage account and the affordability of certain stocks, it’s a great way to teach them some lifelong lessons.